Submitted by dennis on Monday, June 4, 2018 - 1:01pm. I signed up to receive Amazon Treasure Truck email notifications in San Diego earlier this year. 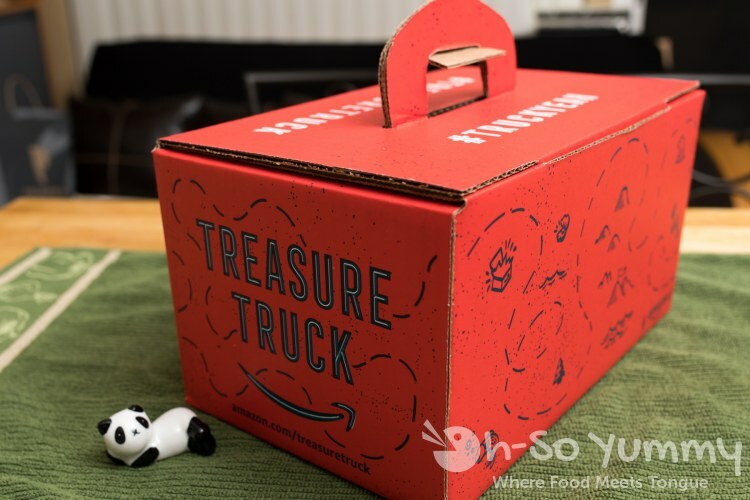 Treasure Truck is a new special promotion service by Amazon for select US cities including San Diego. They have several surprise offers a week but the catch is that you must pick up during a certain window of time at one of their truck stop locations. The locations vary but it is never hard to spot their bright blue truck. There's no need to come early because they open right on time (not before). The pickup was simple, where I just showed my confirmation code to receive my item. A friend can pick this up as long as you pass the confirmation code to them. There's a limited number of items sold so don't wait to purchase if you really want something. We've ordered a few items so far which we'll review in the next sections. The first Treasure Truck offer purchased was $24 for a pair of Porter & York Ribeye Steaks that have been wet-aged for 28 days. They came chilled in a special red carrying box for this purchase. The box was rather large for what was inside but it did its job of sustaining cold temperatures during the transport home. I was pretty stoked for this item since I've never cooked aged steak before. Here's the meat packaging after opening the box. 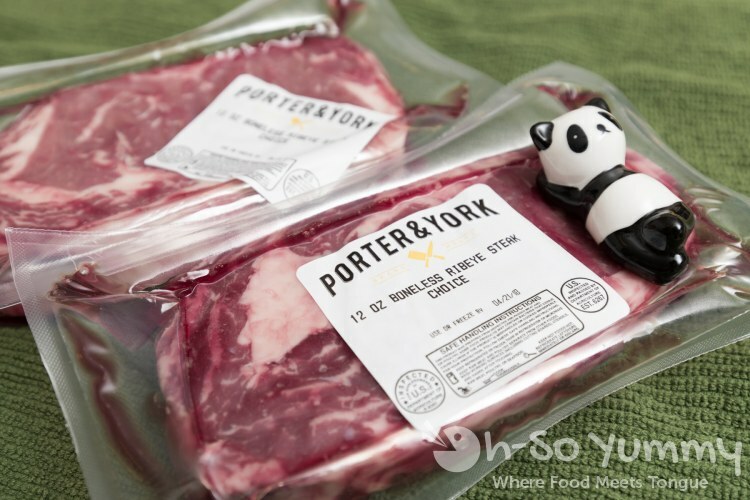 It comes with two separately packaged steaks in a 12 ounce portion. For cooking steaks, I like to season with kosher salt and coarse black pepper. I spread a very thin layer of olive oil over the surface that acts as lubricant for the grill or pan plus it allows the seasoning to stick while I flip the steak over. After dressing the steaks, I refrigerate for about 2-3 hours. Afterwards, I pull the steaks from the fridge to thaw for 30 minutes. 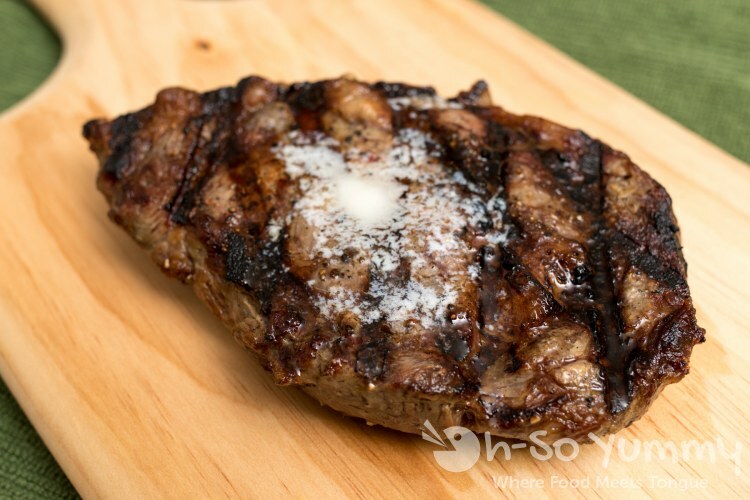 From there it takes anywhere from 9 to 12 minutes on the grill depending on the steak thickness. I pull the steaks off the grill when the steaks reach an internal temperature of 125 degrees Fahrenheit. I then add unsalted butter on top of the steaks so that they can melt into the meat. After that I cover the steaks loosely with aluminum foil and allow it to rest about 5 minutes. The internal temperature will rise slightly but stays within the vicinity of rare to medium rare. Look at those sear marks! I never used to get those when I used the original set of grates in my grill. After switching to Grill Grates, those sear marks have happily become a part of everything I cook on the grill. Check out my Grill Grates Review for in-depth coverage. I'm usually anxious about how the steaks turn out because I definitly do not want to overcook and ruin it. Lynn cut into her steak first which revealed a beautiful and even red color. Phew! The flavor of the Porter & York steaks were subtle while the texture was very tender. The 12oz portion of Porter & York dry aged steaks were perfect size to eat with a side of salad and homemade mixed drinks. IMHO, I didn't really taste much of a difference between this wet aged steak versus the ribeye I regularly cook. I would probably need to compare them side by side in order to assess this better. That being said, I'd be willing to try something like this again but for the cost I'm perfectly happy with a regular Costco ribeye steak. Costco sells choice for $9.99/lb and prime for $14.99/lb and their cuts are thicker than at most supermarkets. I've also found consistent quality and taste with Costco meats which we use for our smoked pulled pork and maple bacon. Iberico Cheese which is a mix of cow, goat, and sheep's milk imported from Spain. Fromager d'Affinois imported from France. Goat Gouda Cheese imported from Holland. and Artisan Crackers by La Panzanella in USA. I know many people who can just eat cheese simply by itself (string cheese, laughing cow, cubed cheeses, etc). For me, I always had to complement it with something else to fully enjoy and appreciate the flavors. 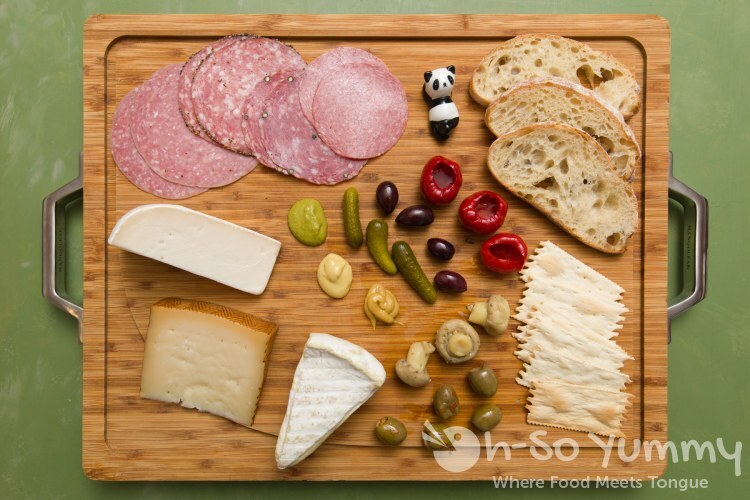 Lynn and I decided to go all out by adding salami and olives for our tasting! Here's our little cheese platter! The Iberico Cheese was my favorite. It is a mild flavored and hard cheese that is similar to manchego cheese. The Fromager d'Affinois was Lynn's favorite. This one is similar to brie cheese and is very soft and creamy. Last but not least is the Goat Gouda cheese. This actually had a layer of wax on the outer edge so make sure not to eat that part! This medium firm cheese was mild, salty, and a little sweet. 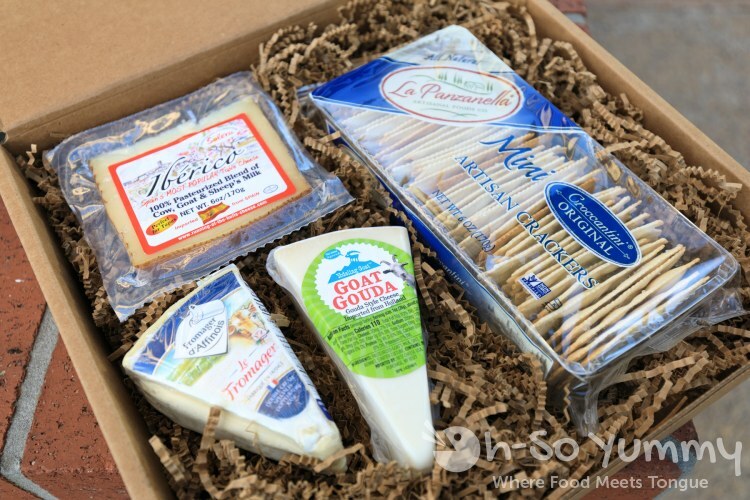 We also thought the crackers were perfect accompaniment to the cheeses, sturdy enough to hold the cheese while adding a crisp to each bite. *In case you're wondering, those mini pandas are actually chopstick rests from a Japanese pottery shop in Mitsuwa Market. They're sold individually but we just had to collect them all since they looked so fun! Besides food items, Amazon Treasure Truck also sells a lot of other things like toys, household goods, electronics, etc. You never really know what they'll be selling. From what I've seen so far, they're generally worth checking out with their decent discounts. Our picks were the food related items such as the steaks and cheeses above. I also recently purchased a set of stainless steel stackable Calphalon pans for half off retail which Lynn loves. 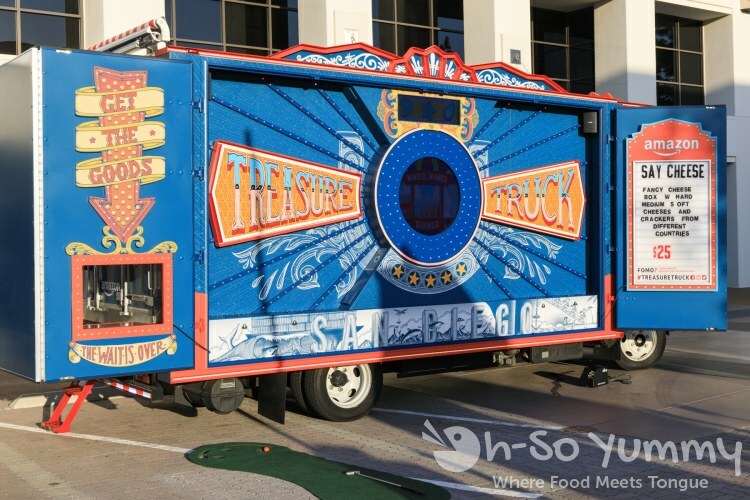 Have you heard of Amazon Treasure Truck and/or made a purchase from them? Let us know what you think! I've never heard of this! The steak box looks impressive but agreed that the contents are much smaller than what you'd imagine. I thought the panda figurines were included in the packages. Boo. Costco steaks have been a hit or miss for us. 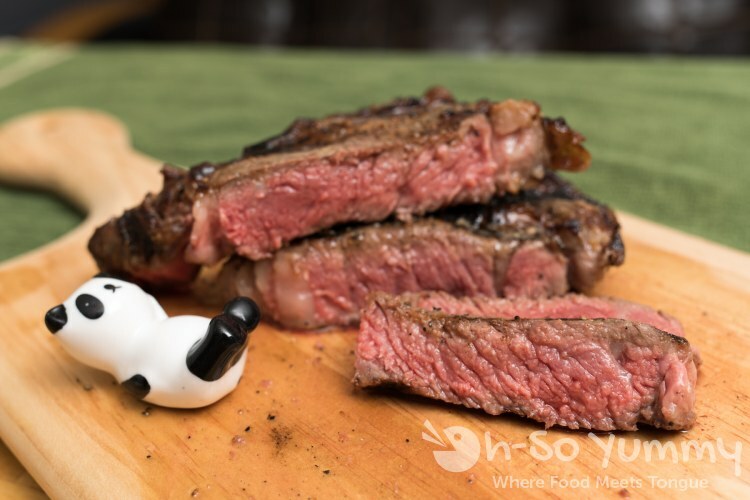 Have you seen their tomahawk rib eye steaks offered on weekends? THAT is my next big steak splurge there. The Costco choice steaks are sometimes tricky to pick out. Like I'd see them pack two really nice and marbled ribeye steaks but the third one didn't have enough fat for my preferences. You may have to dig around to find a perfect package set. Otherwise you may have to look at their prime grade steaks. I've only had the tomahawk once and it was pretty good. Normally, with something that thick I'd put it in the oven and slow cook it for about an hour and then finish it off on the grill with a quick sear. But I decided to try slow cooking it in the smoker this time around and then finishing it on the grill. The added smoke flavor made it quite interesting gave it a beautiful aroma. Bummer the wet aged steak wasn't different from the Costco steak. I can taste the difference when I go to Flemings. I have NEVER heard of this! But WOW...I want access to this where I live. I guess that is what I get for living in a rural farming community away from population. How lucky you are, lots of goodies, and that cute panda, adorable! This is amazing!! I really wish they would do something like this near me. I would totally have ordered this box. since hubby is ordering them, he told me that food items sell out the fastest! they are expanding so maybe in your market soon! Amazon truck, cool idea. I believe don't have one near me. The panda in the meat was a cool detail. Good thing you have experienced with cuts and meats and could compare the cuts to a better option. Oh my gosh, I love steak and cheese and didn't even know about this! I'm checking it out!! they have all kinds of deals! if hubby sees something he is interested in, he first asks me if we should get it! steak is great when it is prepared properly (by hubby)!